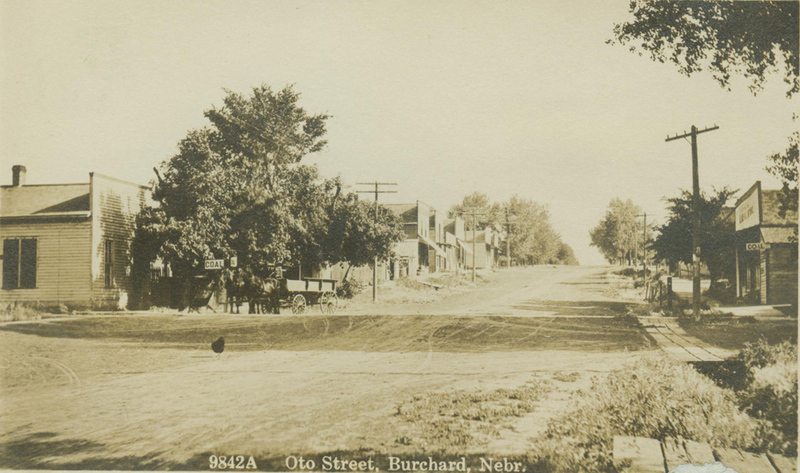 Burchard, Nebraska, located in Pawnee County in the southeastern part of the state, has been associated with several branches of the Cox family since prior to its founding in 1884. Prior to the founding of the town, letters were addressed to Tipps Branch. A short history of the community has been prepared by Clara Dingwell. Sam Cox, son of John Washington Cox, purchased land in Township 30, two and one-half miles south of present-day Burchard in 1870 (the west half of the northeast quarter, indicated in gray on the map to the right), and moved there with his bride, Ellen Margaret Patterson, after their marriage in 1879. They lived there until 1888 and then bought another farm, where they lived until 1901, when they moved into Burchard. Other members of the John Washington Cox family also moved to the Burchard area, including Frank Henderson and his wife, Anna Costello (1884), and Elmer Cox and family (1892). 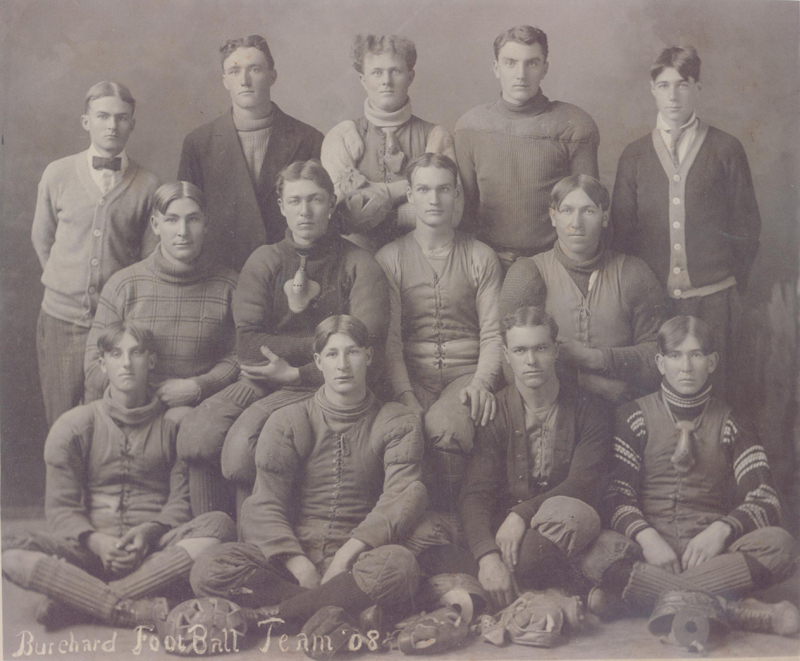 Hiram Cox (of the Richard Rue Cox family) and family also lived in the Burchard area (from 1881 to 1884 and again from 1892 to about 1899). Sam and Ellen Cox had a large family of three daughters and six sons: Lucia (who died as an infant), Eliza, Frank, Fred, Sam, Clay, Ada, Jerome and Orson. Their home in the northwestern part of Burchard became a center of family activities through Ellen's death in 1950. Several of the children lived in adjacent houses at different times, Jerome remaining next door through his death in 1958, and his widow Dorothy living there until 1980. The other Cox descendants also lived nearby. Four reunions were held at Burchard in 1990, 1993, 1996 and 1999. Burchard men in World War I service, as listed in The Burchard Times. Clay Cox, Frank Cox, Jerome Cox and Lyle Henderson. Chet Borden married Lyle's sister, Irma Henderson, in July 1917. Paper courtesy of Louise (Martin) Welsch. Photo taken about Summer 1941 in Burchard. Back row: Ada (Cox) Martin, Ruth Anna Martin, Rilla (Carter) Cox, Don Leitschuck, George Transue, Helen (Inglis) Cox, Ellen (Patterson) Cox, Frank Cox, Dorothy (Disher) Cox, George Martin, Ellen (Cox) Leitschuck, Fred Cox, Iva (Grinnell) Cox, Ted Leitschuck, Mary Lee Cox, Jerome Cox, Tom Cox (son of Jerome), and Orson Cox. The six children in front are Louise Martin, Lois Martin (in back), Sherry Cox, Martha Cox, Bud Leitschuck (probably) and Tom Cox (son of Orson, standing in front of his mother Iva). Photo taken about Spring 1947, next to house of Jerome Cox in Burchard. Back row: Lois Martin, Mary Lee Cox, Louise Martin, Ellen (Patterson) Cox, Ruth Anna Martin, Helen (Inglis) Cox, Dorothy (Disher) Cox, Ada (Cox) Martin, Frank Cox, Jerome Cox, George Transue, George Martin. Front row: Luke Cox, Don Leitschuck, Martha Cox, Leslie Cox, Jerome Cox, Jr., Ellen (Cox) Leitschuck (with daughter Merry) and Ted Leitschuck (with daughter Cay). Mr. Transue was the father of Jerome Cox's first wife, Hallie.